FOXBOROUGH, Mass. -- Give 'em a hand: Tom Brady and the New England Patriots are heading back to the Super Bowl. And, with the game - and possibly the season - on the line, the Patriots star came up big again. Brady finished 26 of 38 for 290 yards and two touchdowns for the Patriots (15-3), who'll play the winner of Sunday night's game between Minnesota and Philadelphia in Minneapolis on Feb. 4. The Patriots then ran out the clock, with Dion Lewis' 18-yard scamper with 90 seconds remaining sealing the victory. 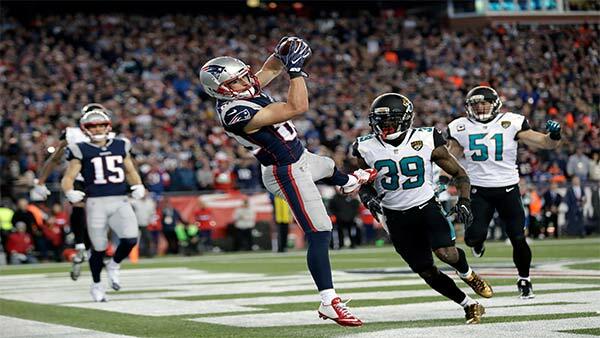 And they did it mostly without tight end Rob Gronkowski, who left the game late in the first half and didn't return. Brady's hand was the most-scrutinized body part in Boston since the quarterback's right ankle before the 2008 Super Bowl, and Red Sox pitcher Curt Schilling's right ankle tendon - the bloody sock - in the 2004 playoffs. Brady came out for warmups without a glove on his hand, and he came out throwing. He completed his first six passes - including a 20-yarder to Amendola on fourth-and-1 from the Jaguars 30 - for 57 yards to march the Patriots down the field. The drive stalled when Brady was sacked by Dante Fowler Jr., and New England settled for Stephen Gostkowski's 31-yard field goal. The Jaguars made some big mistakes that hurt them just before halftime. Bortles completed a 12-yard pass to Lewis on third-and-7 from the Patriots 44, but Jacksonville was called for delay of game - after New England called a timeout. With just over two minutes left before halftime, New England's offense took over and the fans chanted "Bra-dy! Bra-dy!" And their quarterback delivered - with some help from the Jaguars on two long penalties. On first-and-10 from the Patriots 40, Brady threw a long pass for Gronkowski, who was injured when he got popped by Barry Church just as the ball was arriving. Church was called for unnecessary roughness, putting the ball at Jacksonville's 45.